I am currently fitting a new head gasket to my S and I noticed a few of the tappets are slightly pitted when I removed the cams, they are not noisy though but I do want too replace them to stop any wear to the cams. I have a complete S2 engine spare so I thought I would use the tappets from that to replace the pitted ones. Although they are all in good condition, they were actually different compared to the S, I expected them to be the same? Diameter is the same but the body is shorter? I have found a P/N for the S2 928.105.312.02 but I can't find the P/N for the S to see if they are supposed to be the same part. 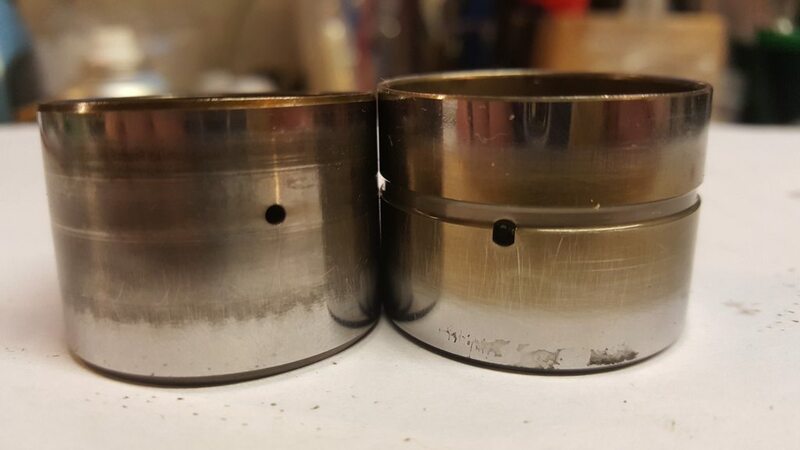 A picture of both for comparison, the S2 has no oil channel around it and is slightly shorter, the oil hole is also located slightly lower. Do we think this is a VW tappet and they have maybe been replaced in the past or is this how it should be? The are both stamped INA. If have to buy new do the VW ones have the same amount of valve lift as the originals? Has S2 got greater valve lift? It maybe to stop the buckets bottoming out in the head. so tappet part numbers as shown in the current PET2. 928 105 312 02 @ £51.08 each. Its a bit easier with knowing the engine type. Euro Car Parts do them. My engine I need them for is an 2.5 S M44/40 and the spare engine I have is an 3.0 S2 M44/41 so as I have the same P/N for the S2 as you found on PET for the S I assume they are the same although as Tr7v8 says the bucket is shallower to maybe stop it bottoming out due to the higher lift of the S2 cam. I measured the top of the tappet (cam interface) to the point where the valve stem sits once they are installed and all the S and S2 tappets are 19mm, give or take a few thou, although I do prefer the tappets with the oil channel as this holds more oil in this area but I don't seem to be able to get those any longer? I will do a bit more checking but I think the S2 ones I have should be suitable by the looks of it. Looking in PET the S was only made in 1987/8 if I recall correctly and the S2 came out in 1989 which makes sense as I can only see those engine designations against the respective dates. So I'd say the S2 tappets are interchangeable with the S as PET lists the part number you have given for the M44/40 engine. The S was an experimental engine so maybe it did come with different tappets from the factory but after Porsche had done the research and analysis they needed the S2 tappet became the refined / finished part and is backward compatible. I would be interested in a set for £70 , if you know where. I have an INA part number 420 0010 10 which should be compatible but the cheapest I can find those is £15 each. More technical expertise on here for our transaxle cars. As above I think I have found the correct INA part number? I either completely missed Waylander's post or we posted at around the same time! Think I've been burning the candle at both ends recently so apologies that I missed that! Under £75 for a full set can't be bad! - just goes to show it is worth checking around sometimes before ordering parts direct from Porsche! Thanks again for more info. The VAG ones will fit in the carrier but if the oil hole doesn't line up there may be some oil starvation of the tappet. I have been searching for ages now but I can't find the measurement for the oil hole in the VAG ones to compare to the 16V 944 ones? Interesting reading this from the links you posted up about the construction of the tappets event though they look the same. It was in working condition before I started stripping it, the guy I bought it off said it was burning oil, he just replaced it with another engine as it was cheaper than a rebuild. I bought it as I didn't have an engine rebuild project at the time and then there was the option to swap it into my S for track days once it was done, if the cost of rebuilding was viable? I didn't want to start breaking the engine until I knew if it was rebuildable or not, depending what is causing the heavy oil usage, scored bores is one extreme but it could also just be valve stem seals? I won't know until I get the whole thing stripped down.